Howard is married to Robin and he enjoys reading the word, teaching, and counseling others! He likes taking walks, and lifting weights for exercise and he was once a competitive Olympic weight lifter, who owned his own gym! He has lived in the Colorado Rockies, worked on the ski slopes, owned several business and ended up in the desert working in the aerospace field in Arizona! He was taught, trained and graduated from VCLI and was on staff for 5 years! He is a ordained pastor, and has pastored numerous church's, BUT as he says the only real and true credential he has is Jesus Christ! 2 Co 4:15 For all things are for your sakes, that the abundant grace might through the thanksgiving of many redound (abound) to the glory of God. 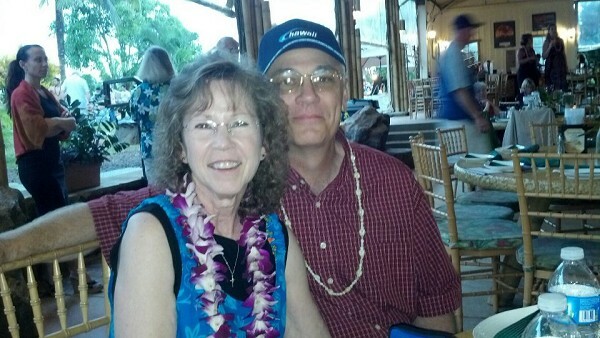 Robin and Howard at a Luau in Hawaii some years back! Robin supports and prays for the ministry and for those that come and seek ministry! She also prays for Howard as he ministers to each individual and couple!